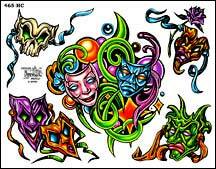 "This quality Official Tattoo Brand™ design sheet by J.D. Crowe is printed in full color on 14 x 11 heavy 67 pound bristol. Line drawings for making stencils are included.